Offers:Up to £350 off selected dates. This 9-day Egypt tour serves up all the main Pharaonic highlights in and around Cairo and the Nile Valley as well as a relaxing overnight felucca sailboat cruise on the River Nile and time by the Red Sea at Hurghada. Cairo highlights at the start and end of the trip include its world-famous Egyptian Museum and the colour and the bustle of Khan-el-Khalili bazaar. Whisked by overnight sleeper train to Aswan, guests will enjoy attractions including the beautiful island temple of Philae, before boarding a traditional felucca for an overnight cruise on the Nile with grand views of its timeless riverside life. Arriving at Luxor, you'll discover the incredible array of ancient sites – from the dazzling temples at Karnak to ancient tombs along the Valley of the Kings - that have seen it dubbed the world's finest and largest outdoor museum. Leaving the Nile Valley, enjoy the R&R pleasures of Hurghada on the Red Sea, whether you prefer scuba diving or just sunbathing! We believe that the Responsible Travel concept has to be a two-way strategy with both the travelers and the local community gaining benefits. We benefit the local communities we visit using a wide scope of activities that have a positive impact on the local economy, directly by donating money to charity organizations, financially supporting some local communities and by recruiting employees who belonging to the local community. We encourage our guests to buy local products and make use of services that people local community offer. Guests visit both the Khan El-Khalili bazaar in Cairo as well as the Aswan markets. They also stop at a Nubian Village when in Upper Egypt. We help indirectly through capacity building projects we implement with our employees and through the experiences and culture exchanges that take place between the locals and the travelers during our tours. We have also considered the social aspect of the local community and how to respect the customs and traditions of the inhabitants helping us operate our tours. We always provide our guests with all the information needed to understand the community they are visiting and we create valuable opportunities for the travelers and the locals to mingle and exchange ideas and thoughts. Accepting a cup of tea from a shop keeper is a big deal for an Egyptian and we encourage our guests do share a cup of tea with these locals even if it means they respect the offer, and not only buy products from them. We educate all our staff on the real life situations of each destination. Sales consultants will use this information to inform potential travelers of the correct information and threats that they may face. It is important for our guests to understand that the recent threats in the Sinai Peninsula are not affecting the running of our tours and that we always put their safety first. By creating long lasting relationships with our local ground handlers, we are able to establish what needs the community has and through their information we can inform our travelers what they can contribute to the local community from their home countries. Be prepared for some very early starts. Thanks for taking the time to get back to us with your post-tour feedback, this is very much appreciated. I'm really pleased to hear that you had such a good trip and that you enjoyed the varied itinerary, including the Felucca and Sleeper Train. I hope that we'll be able to welcome you on another of our adventures in the future!! Be prepared for early starts. Bring a minimum of clothing. Ignore the warnings about dress etiquette as nearly all tourist women worn shorts/tee shirts etc. The company needs to amend the comments in the briefing details so that less clothing needs to be taken of a 'modest' nature !! Karim and the other Mohamed at Hurghada. It was an excellent holiday if rather tiring with the early starts. Our guide was excellent, hotels very good and all staff only to willing to help..and smile !! The operator ran every thing very smoothly so I must commend the company for what was a very well run one with no hiccups at all ..
or not; it's the worth of an object to you that matters, and it would have been good to have engaged more with Egyptian people. 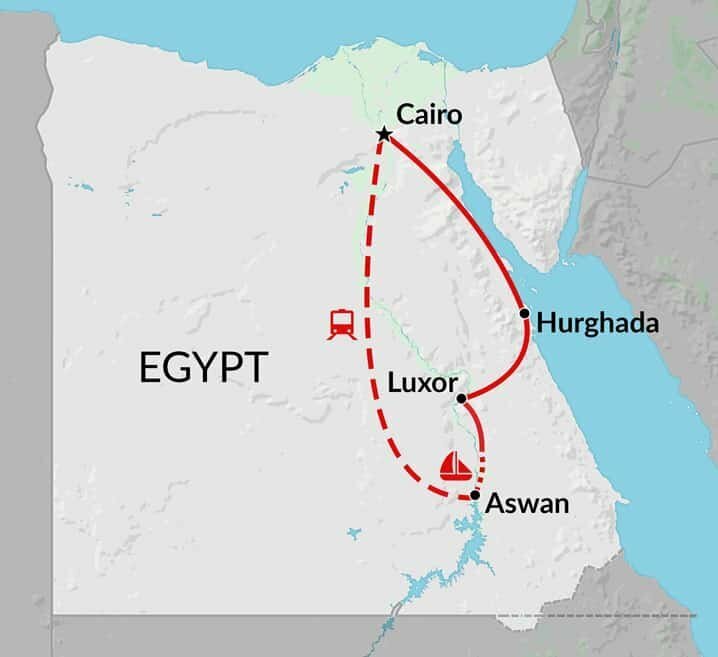 more leisurely pace would have been better and it would have been nice to have been able to get to know a bit more of current day Egypt as well as its historical past. temples were made from. They were really happy when we bought things as they got commission and that helped their families. The felucca was a great sailing experience and saved polluting the Nile with a large cruise boat. Our guide was excellent. He was Egyptian with a degree in English literature and Egyptology. He made all the pyramids, temples and tombs come to life with his wonderfull stories and humour. He even taught us to read hieroglyphs! Therefore all in all we were introduced to the locals in an environmentally friendly way and I am sure they benefitted from our visit. should do a decent sail up the river then drop everyone back to the hotel for a decent sleep. Everyone felt the same!! Thanks for your message and for taking the time to get back to us with your feedback, this is very much appreciated. I’m really pleased to hear that you generally enjoyed the tour and were able to give us a great 4-star rating, I agree with you about Abu Simbel, it’s an amazing feat of engineering and the story of how UNESCO moved the temples is pretty incredible too. I’m sorry that you weren’t happy with the night spent on the Nile. Many of our clients mention that this was the highlight of their trip, since the experience on the Felucca is quite unique. We do prefer to use the smaller Felucca sailboats rather than the larger Nile Cruises where possible, as it's a much more unique experience and benefits the local Nubian people around Aswan much more. However the Felucca captains are now quite restricted by the local authorities in where they are able to sail with passengers onboard and where they can moor up at night. This does mean that in the winter months if the wind isn't favourable and we don't get going early enough, we can't get that far downstream before we have to stop. On this tour we do offer the option of upgrading the Felucca to an extra night in Aswan and in the case of taking this option you would sail on the Felucca during the day before returning to Aswan for the night as you have mentioned. We don’t include this option as standard as we do have many passengers who enjoy sleeping onboard the Felucca, however the choice is available for those who prefer a little more comfort. Overall it’s great to hear about your time in Egypt and thanks once again for getting back to us with your feedback.